As the Israeli military mows down unarmed Palestinian protesters, arms trade expert Andrew Feinstein explains how weapons companies use Gaza as a laboratory to test new products and rake in profits. 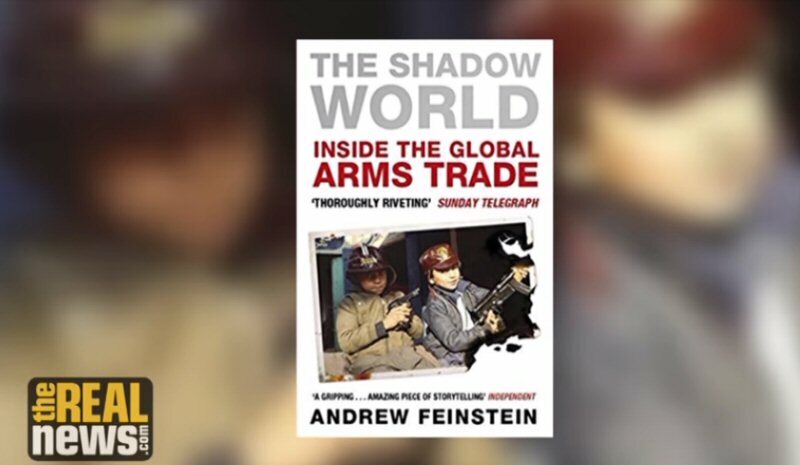 Andrew Feinstein is the Executive Director of Corruption Watch UK and author of ‘The Shadow World: Inside the Global Arms Trade’. This book has recently has been turned into a film that explores the world’s largest and most corrupt arms deals through those involved in perpetrating and investigating them. He also served the ANC under Nelson Mandela and his predecessor Thabo Mbeki. BEN NORTON: It’s The Real News, I’m Ben Norton. I’m joined by Andrew Feinstein, who is a leading expert on the arms industry. He’s the executive director of Corruption Watch UK, and the author of the book The Shadow World: Inside the Global Arms Trade, which was recently made into a film. Andrew is also a former Member of Parliament for the ANC in South Africa. Thanks for joining us, Andrew. ANDREW FEINSTEIN: Great to be with you. BEN NORTON: Today we’re going to be discussing the role of Israel in the US arms industry, and specifically the protests in Gaza. For the past six weeks now, protesters inside Gaza have been leading non-violent demonstrations and being gunned down en masse. There have been large massacres of unarmed protesters by Israel, and in fact, on Monday, dozens more Palestinians were killed. Thousands have been shot with live ammunition, including some experimental forms of munitions used by the Israeli military against unarmed peaceful protesters inside Gaza. How is this also related to Israel’s role in the U.S. and global arms trade? So, we have these protests which are a threat to Israel’s national security- which in itself, is a very questionable point. But that’s how they would argue it. And they would then continue the argument that, “Look how we deal with this through our surveillance equipment, our equipment of ongoing repression of the occupied territories, we know exactly what the Palestinians are planning and when they’re going to plan it. We know who the ringleaders are. And this is how we deal with it, with not just brute force but also the competitive advantage that our technology gives us.”. And they will speak to a variety of weaponry that is actually illegal to be used in the world. But Israel is signatory to very few of those multilateral agreements, such as the treaty to ban cluster munitions. So, we have seen, time after time, the use of cluster munitions, the use of various chemical weapons in the occupied territories by Israel, and the marketing of these weapons. So, how does this affect the United States of America? First of all, because of the relationship between the U.S. government and the Israeli government, between U.S. Defense contractors and Israeli defense contractors- many of whom have a very big state component to their composition- it is possible to be testing what are effectively illegal forms of ammunition and weaponry in Israel’s activities. And second of all, it ensures that the United States can use similar marketing devices to the Israelis in selling their defense sector as a key component of the growing homeland security surveillance and repression industry. So, that is sort of the the marketing, the economic dimension. I should also mention that there is a very important political dimension to all of this, as well. Now, the reality of the arms trade is that it’s by far the most corrupt trade in the world. A gentleman by the name of Joe Roeber, at Transparency International at the time, calculated that the arms trade is responsible for around forty percent of all corruption in world trade. And one of the reasons for this is the very close relationships between defense contractors and governments- governments both in their myriad state forms, but also in the form of political parties, and individual politicians. And we have seen massive amounts of money flow into political campaigning across the political divides in the United States of America and in Israel. It’s most apparent in the U.S., where one can actually track the vast amounts of money that are given to individual candidates and to political parties, and the projects that those individual politicians get back for those defense contractors in their home states or districts. So, the other thing that the symbiotic relationship with Israel does, is it keeps this flow of money going constantly, so that everybody who benefits from the defense sector- what Lawrence Wilkerson refers to as the “national security elite” globally- that the flow of money continues to flow amongst the defense contractors, the individual executives, not just amongst political parties, but also amongst individual politicians and individual campaigns. And this really underpins both the American and the Israeli political systems. So, it’s another reason why the relationship between the two is so incredibly intertwined. BEN NORTON: Yeah, and on that subject numerous Gulf regimes, including Saudi Arabia, Bahrain, and the United Arab Emirates, also expressed joy and support in response to Trump’s decision to withdraw from the JCPOA, the Iran nuclear deal. As you show in your book and in your movie, these Gulf monarchies are also major customers for U.S. weapons. They have bought billions of dollars in U.S. military equipment. Can you comment on the relationship of these Gulf monarchies to the Iran deal? ANDREW FEINSTEIN: Saudi Arabia, in particular- to a lesser extent, the states of the Gulf Cooperation Council, and of course Israel, have been calling on the U.S. government to attack Iran. Certainly, most of the two decades, almost, that I’ve been working in this area. And the reason for that is really about control of the Middle East region. And here the issue is, the only real threat to a Saudi-Israel-U.S. access in the region is Iran. Now, President Obama saw the way of addressing that as coming to this nuclear peace deal with Iran, making Iran more of a trading partner by doing away with the sanctions and ensuring that there was no potential for Iran to develop nuclear weapons. But to Saudi and Israel, in particular, as well as some other countries of the region, this was absolute anathema, because this meant that Iran could also become an economic, not just a political power in the region. And this affected their hegemony in the region, just as it affects American hegemony in the region. So, they have a common political agenda. But there is another irony of the situation, and that is that Saudi Arabia, in particular, and the states of the UAE, to some extent as well, are not only the second biggest purchasers of weaponry in the world behind the United States of America- so, an absolutely crucial marketplace to the companies and to their political sponsors. But as crucially, Saudi Arabia in particular, through its Wahhabi ideology, through its clandestine support for various groups that are described by the United States of America as Islamist groups or Islamic extremist groups, Saudi Arabia is actually a part of the national security problem that our political leaders are arguing we need to keep defense budgets at seven hundred billion dollars plus a year in order to thwart. So, we are actually supporting, with weaponry and with regional political support, some of those who are ultimately undermining our own national security. And this is the extraordinary irony of the role of the arms trade in the world at the moment. And the way in which it interacts with geopolitics is that we claim that these industries are an essential part of our national security, that they are essential to our own personal defense. But at the same time, by our alliances with countries like Saudi Arabia, the United Arab Emirates, we’re actually selling weaponry to countries who, it’s being shown, have supported some of the violence that we are trying to get rid of in the world. BEN NORTON: Well, we’ll have to end our conversation there. I was joined by Andrew Feinstein who is the executive director of Corruption Watch UK and the author of the book, The Shadow World: Inside the Global Arms Trade, which was recently made into a new film. Thanks for joining me, Andrew. ANDREW FEINSTEIN: Thanks for having me.